Prudent homeowners know that they need to eliminate all existing potential fire hazards. This is to avoid the heartbreak and danger of being a home fire victim. In reality, this is easier said than done. The best thing that you can do for yourself and your family is to really be aware of present dangers and to put in necessary safeguards against potential fire risks. Air and dryer duct cleaning fall under these protective actions you should consider getting done as soon as possible. Dryers require an exhaust port that connects them to the outside of a home or building. This connection is made via a vent. Over time, the dryer vent can become piled up with lint, which is an extremely flammable material to have in an area that reaches such high temperatures when in use. Most homes have one of these hidden fire hazards installed and if you do too, it is recommended to reach out to professionals to come and check for lint build-up. They can also see if your vent is properly installed and if the materials that it's made out of are still in good shape. Should you find out that the materials used are fire hazards, if there is irreparable damage in the integrity of the vent or if it is not optimally placed, a dryer vent replacement will easily rectify the problem. The most common issue regarding these vents is the aforementioned lint build up. When lint clogs the exhaust vent, the clothes dryer will become very susceptible to overheating. The scary thing is that the lint itself is very combustible which makes this combination a very deadly one. 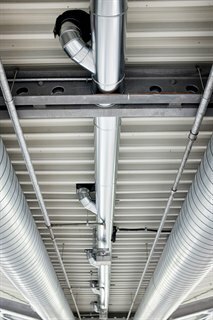 Because the exhaust vent is typically hidden out of sight, this problem is not always easy to recognize in advance. Even so, an increased level of humidity in the room your dryer is placed in and wet clothes after running a normal circle are both early signs of lint build-up that you should act on. Engaging dryer vent cleaning services are performed by our professionals in the most cost-effective way, to prevent household fires caused by overheating dryers. You can try cleaning a dryer vent on your own but if you're only armed with the common household cleaning appliances, you probably won't get all the build-up out. In order to ensure the safety of your home or business, it's always best to leave it up to the experts. If your safety and that of your family or office building is precious, it's best not to leave it up to chance. 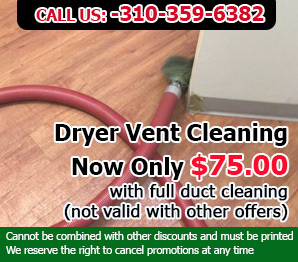 Take these matters seriously and contact Air Duct Cleaning Redondo Beach to ensure your dryer duct is out of any potential danger!